What color is your carpet? 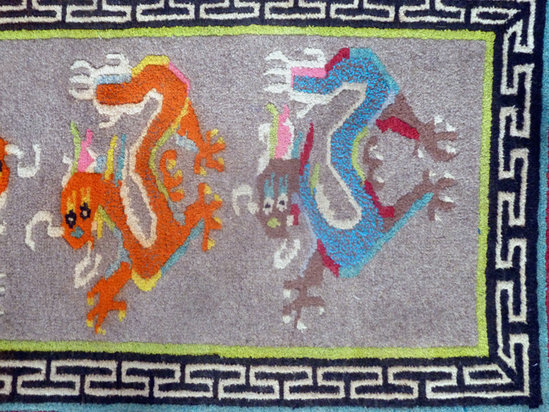 I had no intention of buying a rug until i went a bit mad in macleod ganje.. Even though i loved looking at and touching big silk kashmir rugs and must of had the sellers excited, I didn't buy them...Ended up buying a big tibetan one from the refugee place and will arrive in a few months... The thing is the highest quality silk rug displayed to me was originally priced at $1800 american, and I thought that was alot, until i went to the cottage emporium on Jan Path and the same sort to my feel and vision was about $5000!!!! Surely my hands and eyes don't lie? The thing is the highest quality silk rug displayed to me was originally priced at $1800 american, and I thought that was alot, until i went to the cottage emporium on Jan Path and the same sort to my feel and vision was about $5000!!!! Surely my hands and eyes don't lie? I'm surrounded right now . . .
by carpets I've bought in India and Pakistan. To my right a cotton dhurri, bought in a Government shop in Varanasi . . . beyond that a wool prayer rug bought from a man named Attaullah in Peshawar, Pakistan . . . behind me another dhurri, from Jaiselmer . 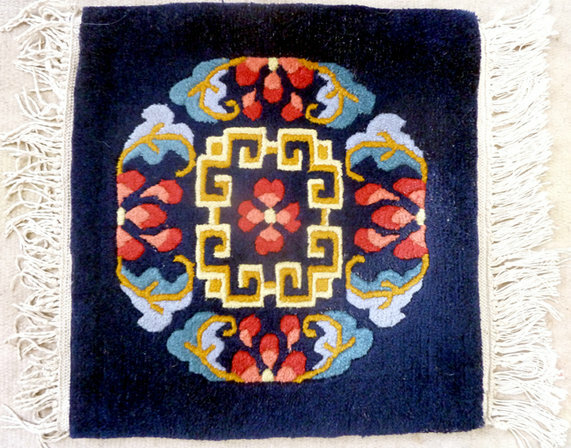 . . a Tibetan rug from from Dharamsala . . . and waiting for my return to India, a 9 X 12 wool carpet in Varanasi. They all have several things in common: I've long forgotten what they're made of . . . how much they cost . . . I paid for them what they were worth to me; they are memories, and stories and faces and great chicken tika in Attaullah's shop and many, many, many cups of tea . . .
Knowing, really knowing, carpets is a skill that lies somewhere between brain surgery and rocket science. It sounds like you have some good help with you on your buying trip. That can help. The carpet that's waiting for me in Varanasi started out at @ Rs 10,000. The manager of my guesthouse (a very honest man) did my bargaining for me. The bargaining was heated. Several times the carpet seller walked off (nice theatrics) . . . the whole session lasted over two hours. We shook hands @ just over Rs 3000. Two friends of mine bought a 4x6 woolen rug apiece in Delhi in March for Rs9000. Starting price was Rs 24750. Everyone seemed to be happy. Took about an hour and a half and three cups of tea. | bang a whore? Bangalore Dammit! What is it with carpet sellers that's so mesmerising? The one time I went into one for no other reason than escaping the rain in Bangalore, I almost bought a carpet. I had no idea whether it was good, bad or anything; just liked to buy. A hard nudge by my wife, followed by a steely stare bought down the euphoria. Good thing too, it would soon moldered in a corner. At their worst rugs are dust traps and homes for insects and allergens, they wear out quickly in the heavily trodden on parts and they can stick up a corner or edge at the most unopportune times .... making you fall flat on your face. But at their best they are hand-woven artistic beauties that will warm a home(literally & figuratively) with a rare symphonic palate. ... you can always hang them on the wall! I cannot imagine using them in this [chennai] climate, though the salesman always tell me they are fine. Maybe they have a picture of me living in some big AC ex-pat house! Looks and feel (and the odd kashmiri Carpet Wallah)can be deceiving ..... was that real silk or fake silk(mercerized cotton) ? 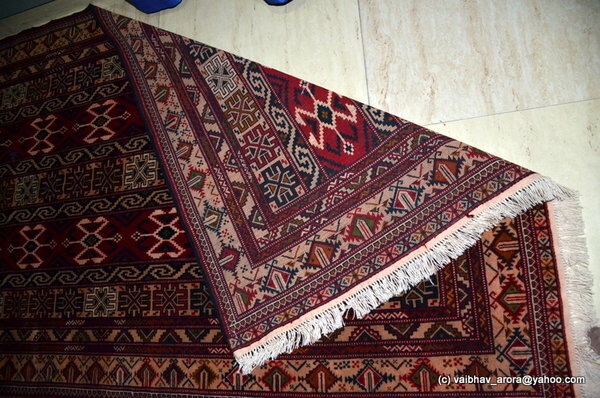 I spent hours looking at rugs all over the parts of India I visited. 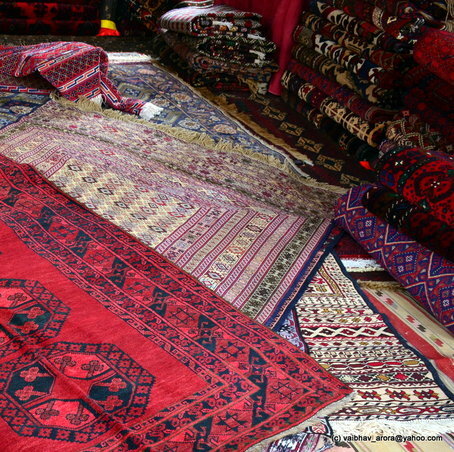 In a ballpark cost, really nice silk kashmiri rugs 3'x5' were approximately $100-$150.00 anywhere including Kashmir. 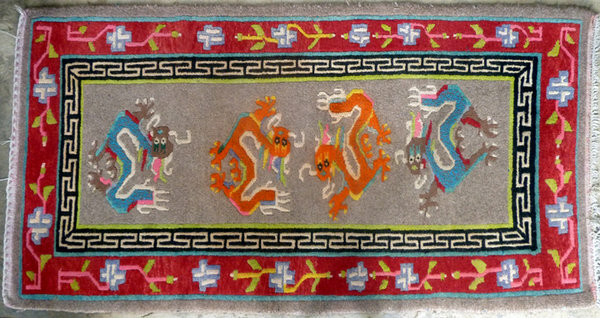 Nice wool rugs 4'x6' depending on knots per inch were $100-$200.00. You can find bargains don't spend much more than that, altho the dealers will try and get you for as much as they can. Happy trails. I'm curios as to where did you find a baloch carpet from in Kashmir (mentioned in a previous post of yours) ? Was it a Baloch style rug? 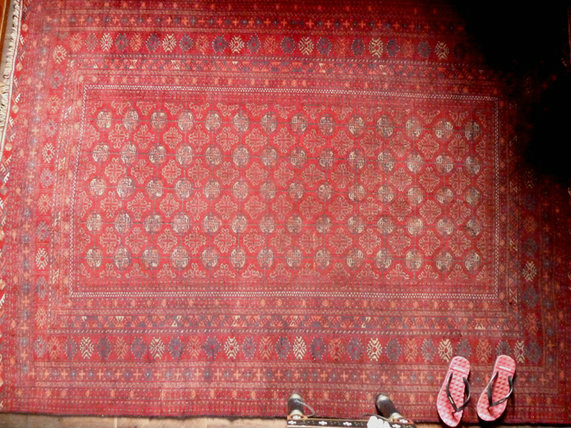 Or a kilim? done by Kashmiris? Or was it from a traveling salesman? Vaibhav - This is the Baluch - 4’6” x 3’. (8K). I don’t know exactly what part of this huge area designated as Baluch it is from though. This is an Afghan, 10' x 7', from years ago bought in Chandni Chowk. This is a local (Uttarkashi, Garhwal) woolen rug, which as i sadly say is all but impossible to find recent years. Dog's favourite. This one is hand loomed by Tibetans in Old Rajpur (Dehradun) and the unit is active, ongoing and hopefully prosperous - all items to order. Or you can find small carpets, like an Asan, which are very handy for chairs, outside in winter etc. :) Well, thanks for putting up your carpet collection for viewing. The baloch is fantastic, and even more so when it comes to the price. 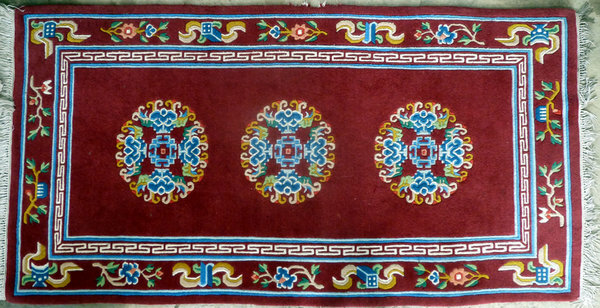 The afghan is very characteristic fil-pa design. I saw a near identical Tibetan piece this year in Tabo (spiti). 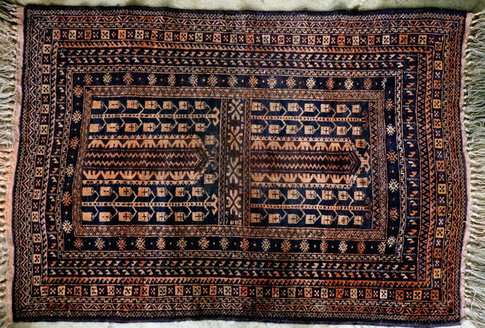 I have a very different afghan piece - it's new and done by Turkmen (settled turkoman / turkmens though) as a part of a cottage industry project in Northern Afghanistan. It's a 6x4 piece and done in what the seller called a 'pomegranate / wood color scheme' - it's more subdued but sort of changes color under different light conditions. I had passed up several stacks of carpets over many many years before settling for this one. I thought I'd add to this carpet discussion by posting a photo of the ones that were passed over. This is of course a very small cross section. 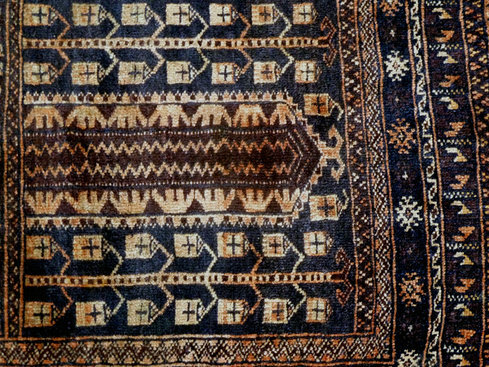 The afghan with very large 'gul' designs is supposedly a camel hair antique. I had doubts on the veracity of that claim due to the deep black used (>50 year old pieces would likely have deep blue bordering on black). Below that on the right and another slightly above are both excellent Kilims.